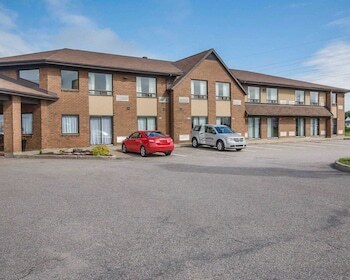 Located in Baie Comeau, Comfort Inn Baie-Comeau is in the business district, within a 15-minute walk of Centre des Arts de Baie-Comeau and Club de Golf de Baie-Comeau. Featured amenities include a 24-hour business center, complimentary newspapers in the lobby, and dry cleaning/laundry services. Free self parking is available onsite. Located in Houston, Houston Motor Inn is within a 5-minute drive of World's Largest Fly Rod and Steelhead Park. Free self parking is available onsite. With a stay at this vacation home in Rossland, you'll be within a 5-minute drive of Rossland Museum and Red Mountain Resort. Free self parking is available onsite. With a stay at Fox Creek Inn in Fox Creek, you'll be within a 5-minute drive of Silver Birch Golf Club and Fox Creek Church. Free self parking is available onsite.